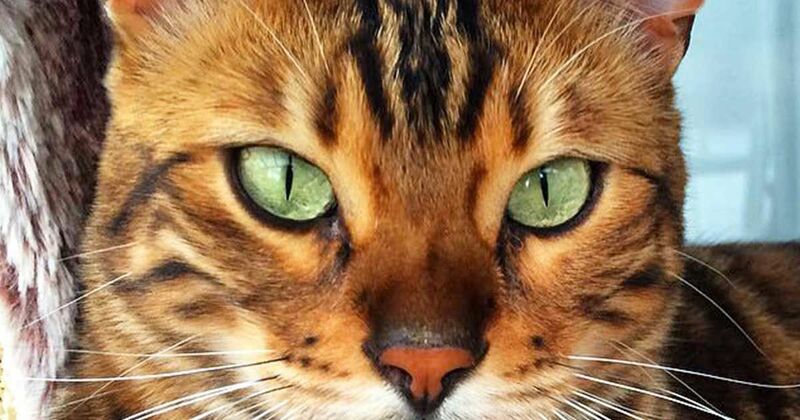 This bewitching Bengal cat has everyone seeing spots — and stripes. With the spots of a leopard and the stripes of a tiger, this cat looks like a creature straight out of the jungle. His unique marking has many skeptics crying Photoshop foul, but his unbelievably wild coat is, in fact, authentic. Thor is a 3-year-old Bengal cat that lives in Belgium with his owners Rani Cucicov and her mother Hilde de Coster. In a recent interview with the Huffington Post, Cucicov shared that people don't often know what to make of her wild-looking cat. “In our neighborhood, everyone that saw Thor for the first time was surprised because they never saw anything like him,” Cucicov told the Huffington Post. This is due not only to the very distinctive marking Thor displays but also because Bengal cats are definitely not your average house cats. Bengals are a hybrid breed of feline that is the result of mating Asian leopard cats with domestic cats. The result of this pairing is a “long, muscular, medium- to large-sized cat, with a broad head and muzzle, high cheekbones, and pronounced whisker pads,” PetMD reports. Bengals are known for their characteristic leopard spots that can appear in a variety of patterns on their lush, soft coats. Many Bengals also exhibit a trait called "glittering," which makes their fur seem to sparkle. These attributes make the Bengal breed alluring, but many caution that the pairing of a wild cat with a domestic cat is more than skin deep. Although Thor's owners have no complaints about their good-natured feline, it is important to remember that these cats can have more wild than domestic tendencies, making them a problematic breed to predict. Additionally, Bengals are highly intelligent, have loud vocalizations and are very active climbers and hunters. In fact, many states in the U.S. have bans against owning hybrid cats, including Bengals, as they are still considered by many to be wild animals, according to Kristine Alessio of the International Bengal Cat Society. While Thor and his fellow Bengal cats are certainly unique and mesmerizing animals to behold, if you're thinking of adopting your own, be sure to do your research on this unique breed and be prepared for a wilder feline than your typical house cat. Can't get enough of Thor's good looks? Check out his Instagram account @bengalthor or follow him on Facebook, and make sure to share this article with your friends. She knew she shouldn't have hugged a cat so sick, but she did, anyway. Semper Fidelis means Always Faithful and is the Marine's motto. So what would a Marine do when a tiny kitten needed help?